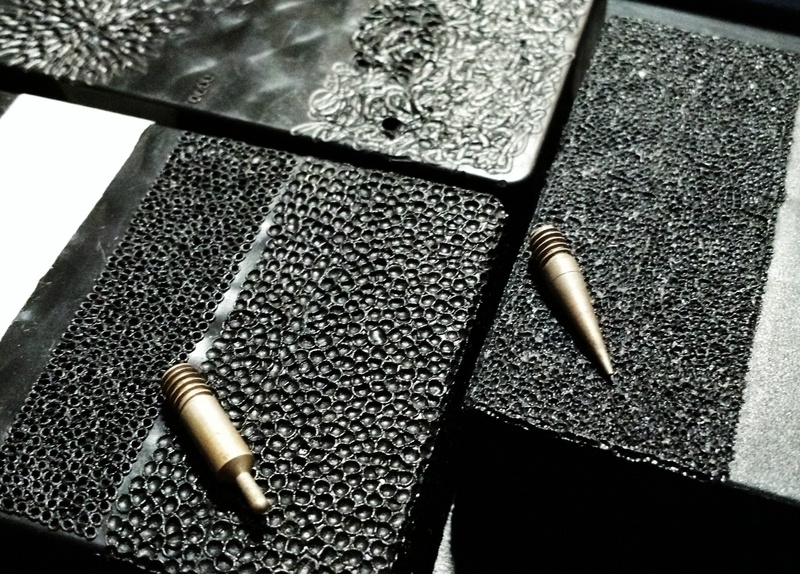 Stippling M&P full-size – How to prepare, practice and go for it! I have previously stippled the detachable backstrap of the M&P9 with a soldering iron. 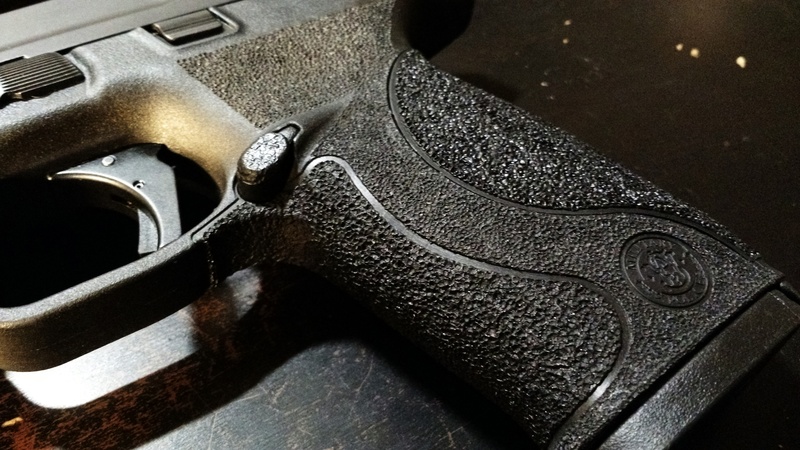 It added some grippiness to the gun, but one a big portion of the M&P9 that is part of my “grip” is still very smooth (e.g., the portion that meets the meaty part of the palm). So I finally went for the full frame with a wood burner (fine tip). For the ‘scale’ pattern that was used for the M&P backstrap, the soldering iron did the job alright (picture above). However, I wanted a finer pattern for the actual frame. So I got a wood burner with several interchangeable tips. It is a $18 investment. Before I decided to stippled the whole frame, I went with GT-5000 grip tapes. It added a bit of grip, but it was prone to shifting a bit and still not as grippy as I would like to be. 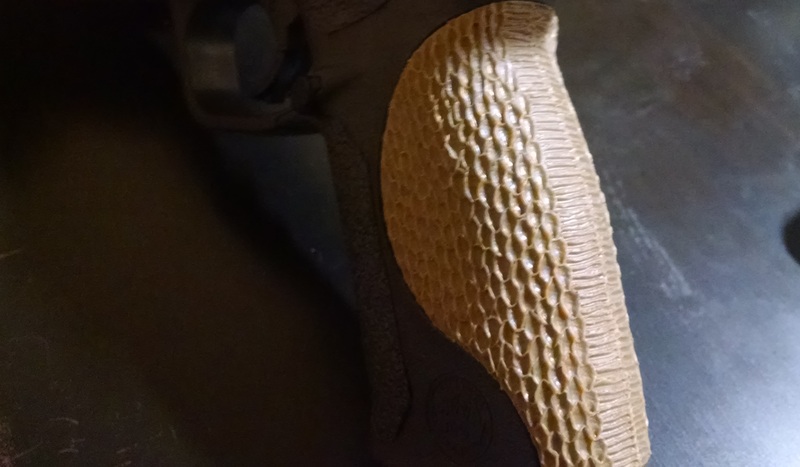 So I figure I’ll go for stippling the whole gun. I used the Walnut Hollow woodburner (~$15). Any other wood burner would do fine, just make sure it comes with a very fine tip. Since stippling on the actual frame is a permanent alteration, my first idea is to get some practice. Everyone on the internet talks about using extra rifle magazines (Pmags) to practice on. Well, I don’t have a rifle, but I have a lot of empty ammo tray. That works. It is a different ‘hardness’ than the actual frame, but it is enough to get some practice in. Use Pinterest or google-image to find some nice patterns. Youtube videos also showed how some people achieve a certain pattern. I decided to try some bigger and smaller dots using a fine tip and rounder tip. Also tried some curvy line pattern (see picture below). 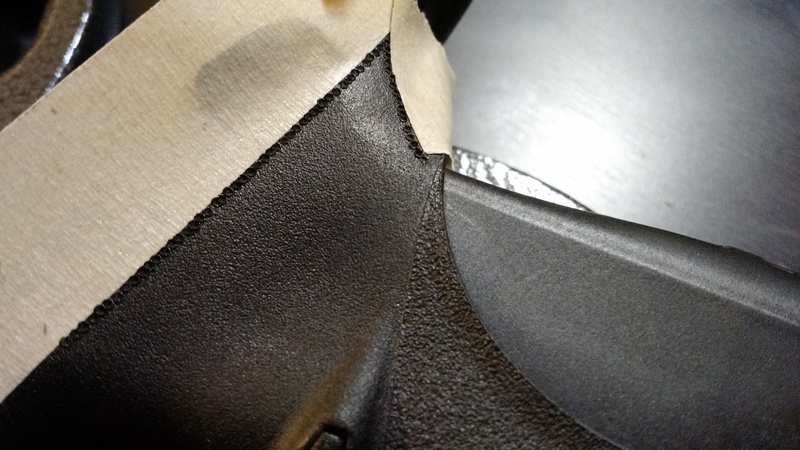 The feel of the bigger dots are smoother, and maybe suitable for the side of a CCW gun that actually touches skin. The small dot on the left of the bigger dots gives a very grippy feel, but I didn’t like the look of it. I tried another version of small dots on on another tray, but instead of lining up all the small dots, I went a more circular and random motion. It allowed some overlap, ending up with the pattern on the right side of the picture, which is what I eventually went with for my M&P9. Left: Small dots with fine tip lined up and bigger dots with round tip lined up. Top line patterns were not grippy enough. Right: Small dots with fine tip done in circular and overlapping motion. After I felt good with the pattern, it is time to just go for it. Masking tape helps to make a straight line for the intended pattern to stop. Used masking tape to define border. Stipped the border carefully. I have read some stories on how people accidentally overheat the frame. I took my time and allowed the frame to cool-down after a patch is done. It took about a full hour since I gave it some time to cool down in between. The result turned out pretty good for a first-try in stippling the frame. I didn’t go all the way to the top in case I ever want to use this gun for competition. ← Previous Previous post: First month of Brazilian Jiu Jitsu (BJJ) – How it is exactly what I needed.